Divisionism (also called chromoluminarism) was the characteristic style in Neo-Impressionist painting defined by the separation of colors into individual dots or patches which interacted optically. By requiring the viewer to combine the colors optically instead of physically mixing pigments, Divisionists believed they were achieving the maximum luminosity scientifically possible. Georges Seurat founded the style around 1884 as chromoluminarism, drawing from his understanding of the scientific theories of Michel Eugène Chevreul, Ogden Rood and Charles Blanc, among others. Divisionism developed along with another style, Pointillism, which is defined specifically by the use of dots of paint and does not necessarily focus on the separation of colors. Divisionism developed in nineteenth-century painting as artists discovered scientific theories of vision that encouraged a departure from the tenets of Impressionism, which at that point had been well-developed. The scientific theories and rules of color contrast that would guide composition for Divisionists placed the movement of Neo-Impressionism in contrast with Impressionism, which is characterized by the use of instinct and intuition. Scientists or artists whose theories of light or color had some impact on the development of Divisionism include Charles Henry, Charles Blanc, David Pierre Giottino Humbert de Superville, David Sutter, Michel Eugène Chevreul, Ogden Rood and Hermann von Helmholtz. Charles Blanc's Grammaire des arts du dessin introduced Seurat to the theories of color and vision that would inspire chromoluminarism. Blanc's work, drawing from the theories of Michel Eugène Chevreul and Eugène Delacroix, stated that optical mixing would produce more vibrant and pure colors than the traditional process of mixing pigments. Mixing pigments physically is a subtractive process with cyan, magenta, and yellow being the primary colors. On the other hand, if colored light is mixed together, an additive mixture results, a process in which the primary colors are red, green and blue. The optical mixture which characterized Divisionism — the process of mixing color by juxtaposing pigments — is different from either additive or subtractive mixture, although combining colors in optical mixture functions the same way as additive mixture, i.e. the primary colors are the same. 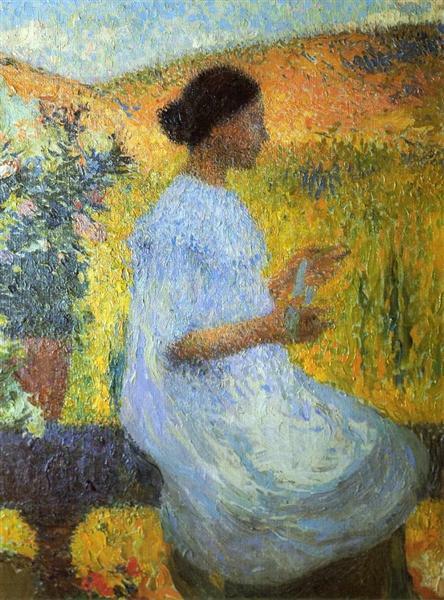 In reality, Seurat's paintings did not actually achieve true optical mixing; for him, the theory was more useful for causing vibrations of color to the viewer, where contrasting colors placed near each other would intensify the relationship between the colors while preserving their singular separate identity.